The biggest mistake I see first-time entrepreneurs make is not consistently reaching out to their target customers. 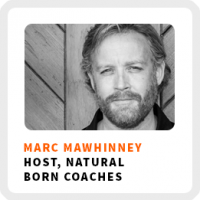 Marc Mawhinney shares how to build a content creation habit to build your audience, so more of your potential clients come to you, instead of you chasing after them. He’s a coach who coaches coaches by helping them get more clients. You can learn more about his work at Natural Born Coaches and check out his podcast by the same name. How Marc built his current audience organically without paid advertising after leaving his real estate business. The 3 pillars of his content creation habit: podcast, Facebook Group and a daily email. Why it’s so important to develop your own voice and don’t be afraid to take a stand. Set an independence day from your job if you are serious about working for yourself. Core work activities + habits: 1) Developing his business and content on podcasts, Facebook, and emails. 2) Journaling. 3) Reading and listening to audiobooks. Ideal work environment: From his home office for general work and he gets his best ideas for content creation during activities like driving, walking, or sitting on the beach. Regains focus by: Listening to a good audiobook to shift his mood. Favorite productivity tool: Online calendars like ScheduleOnce. 90-day goal: Get his book launched. 1) KMF – Keep Moving Forward. 2) TCB – Taking Care of Business.